US stocks were mixed on Monday as investors assessed the fallout of the devastation wrought by Tropical Storm Harvey in Texas. Insurance companies were among the firms posting losses in the wake of the storm, which has caused billions of dollars in flood and wind damage. 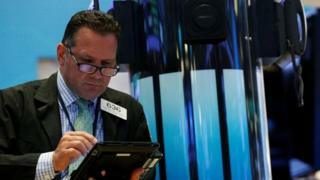 The Dow Jones was almost unchanged at 21,808.4, while the wider S&P 500 index increased by less than 2 points to 2,444.24. The Nasdaq increased 0.28% to 6,283.02. Some of the heaviest declines were seen at insurance companies: The Travelers Co fell almost 2.6%, while Progressive Corp dropped 2.25%. But other sectors, such as home improvement chains, were expected to benefit: Home Depot shares climbed almost 1.2% and Lowe's was up 0.6%. Expedia, though, was on the slide, down by more than 4%, after reports that its chief executive would be leaving the company to lead Uber.